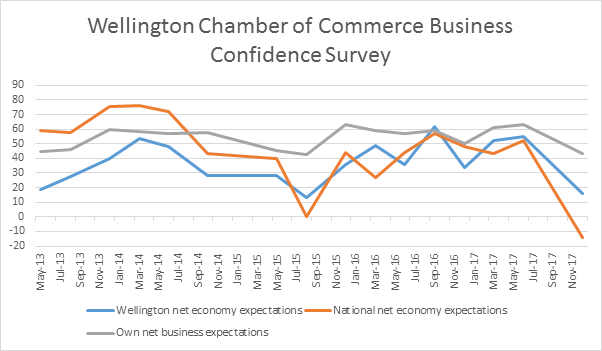 Confidence among Wellington region businesses has taken a downturn across all measurements since the election, according to the latest Wellington Chamber of Commerce Business Confidence Survey. Confidence has dropped in the local and national economy, businesses’ own situations, earnings forecasts, forecast investment in new plant and equipment, and intentions to hire staff. A net 16 per cent of business respondents expect the Wellington economy to improve over the next 12 months – a significant drop from the net positive 55 per cent in the previous survey in June. Wellington business confidence in the national economy has also decreased significantly. A net negative 14 per cent expect improvement, compared with a net positive 52 per cent in June. That is the first time since January 2009 that net sentiment in the national economy has been negative. Some 41 per cent of respondents expect the national economy to decline, with just 27 per cent expecting it to improve. The survey was conducted over a two-week period in November following the formation of the incoming coalition government. It is worth noting that the survey took place during the week which saw a one-day train strike. Businesses’ confidence in their own situation has also taken a big hit, with a net 43 per cent saying they expect to see an improvement over the next 12 months, compared to 63 per cent in June and 61 per cent in March. Earnings expectations are also well down, with a net 41 per cent of businesses expecting an increase, compared to 61 per cent in June and 57 per cent in March. Of all respondents, 55 per cent expect an improvement while 14 per cent expect earnings to decline. The number of businesses expecting to invest more in plant and equipment over the next 12 months has dropped from a net 43 per cent in June to 25 per cent, while intentions to hire staff are also down. When asked what changes they expect to staffing numbers over the next three months, a net 20 per cent of businesses said they expect to be looking for more staff, down from 28 per cent in June. Finding skilled staff continues to be a challenge, with just 7 per cent saying it is easier to find skilled staff than it was 12 months ago, consistent with the June survey. Some 53 per cent say it is harder to find skilled staff. When asked unprompted what barriers are holding back their business, the number one issue is an inability to access or attract skilled staff. This is consistent with the Chamber’s surveys over the past year. When asked unprompted what barriers or issues they believed are holding back the Wellington economy, the most common issue cited was leadership (both local and national). This was followed by infrastructure and transport issues, specifically roads and the airport. Chamber of Commerce Chief Executive John Milford said he wasn’t surprised by the numbers, with the uncertainty about the incoming coalition government’s policies coming at the same time as reports that the housing market was cooling and after continued sales declines for retailers. “I wasn’t surprised, given all that and the results of ANZ’s recent survey that showed confidence at its lowest level in eight years, but I didn’t anticipate some of the key numbers would be as low as they are. “These results reflect a perception that there are uncertain times ahead. What it tells us is that Government has a lot of work to do to prove it will maintain conditions that are conducive to doing business. It has to do that quickly. “It’s clear that businesses are concerned that the announced increase in the minimum wage and proposed changes to immigration, trade, compliance, increasing costs of running a business will hit them. “I believe this is business sending a message to the coalition government that it should be making changes with us not to us, so businesses can make the changes work. “There is some encouragement, however, that businesses remain confident in their own ability.